What would childhood be without heroes? From the 1930’s-50’s our heroes were larger than life, often because they were celluloid, blazing across a giant movie screen, riding a thundering steed. Yep. The all American Cowboy. 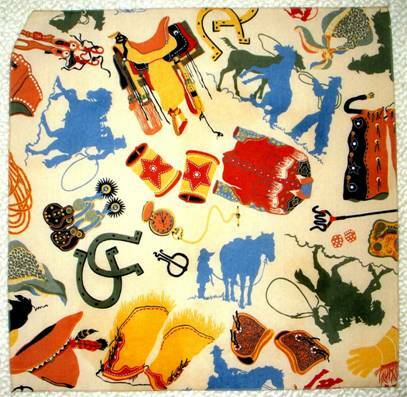 We started this journey in Saddle Up Cowboy, with the likes of Tom Mix, Hopalong Cassidy, Gene Autrey, Roy Rogers, and Kit Carson. 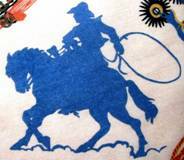 Even the titles of TV shows had the searing crack of a bullwhip – Rawhide, Maverick, Gunsmoke, The Wild Wild West, The Lone Ranger, Have Gun Will Travel. Or eulogized frontiers of uncharted territory – The Big Valley, Bonanza, High Chaparral. More than 30 westerns were on television in 1959 alone. 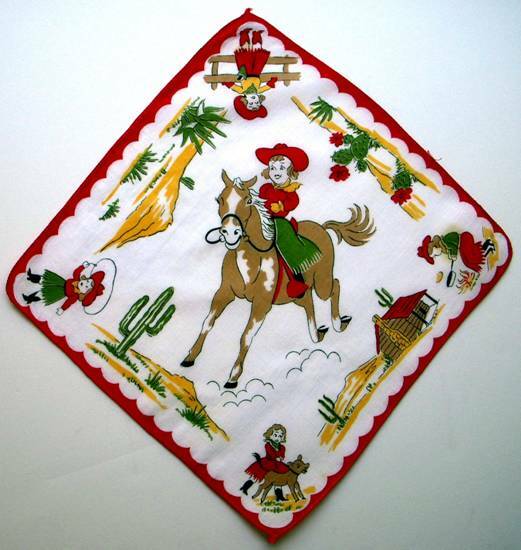 Colorful embroidery on crisp linen features a young buckaroo following Shane into the sunset. Glamorous eyelashes paired with pink chaps, rope and horse have me flummoxed as to whether this cropped hair wrangler is a boy or a girl. 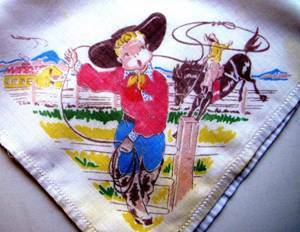 This sweet cowpoke and his equally charming pony roping an adorable calf look more like they’re playing a game of tag. 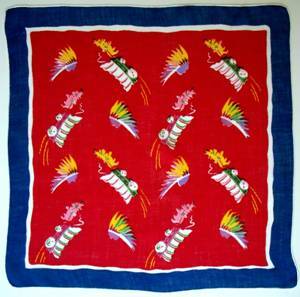 Love the zingy red border and bandana-like center graphics. Here’s a showstopper to make the girls swoon. 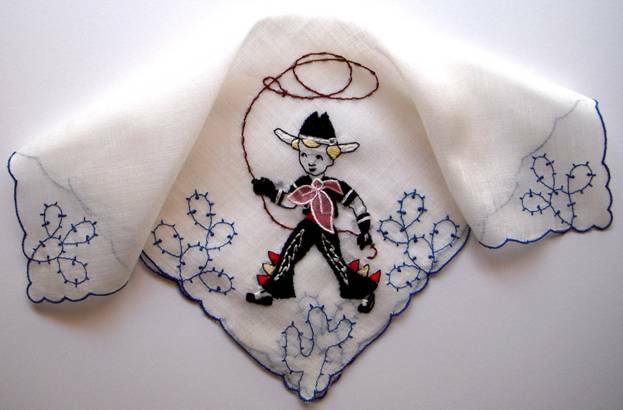 Check out the festooned chaps and huge flowing kerchief on this little vaquero and he twirls his way through desert cactus on this scalloped hankie. Are those tuxedo slippers on his tiny toes? 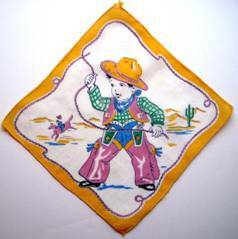 He’s so busy showboating for the crowd, he may well lasso himself with his twisted tangled lariat. 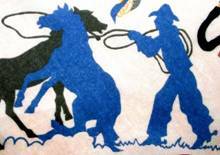 Fun fact: Early cattle herders from Mexico who made their way across the border into Texas and beyond were the first ‘cowboys’ of the west. 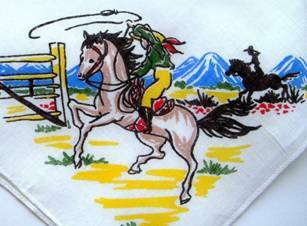 Vaca is Spanish for cow, and a vaquero is a cattle herder. 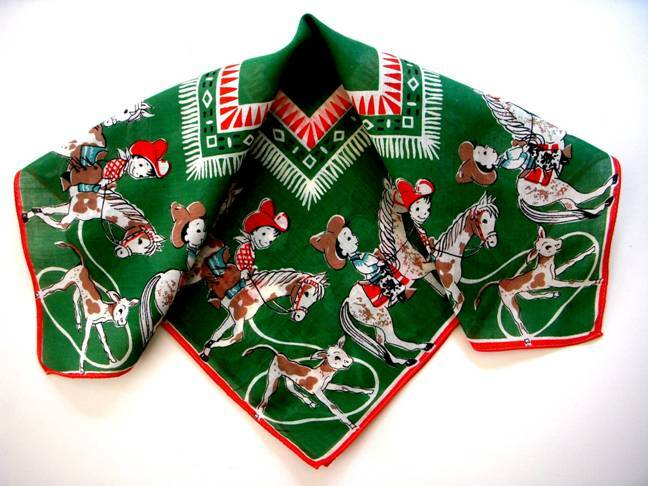 Pronounced ‘ba-kero’ in Spanish, the word eventually morphed in the American pronunciation buckaroo. I love these silhouettes which convey maximum emotion with minimal detail. Steadfast and understated, like the cowboy. 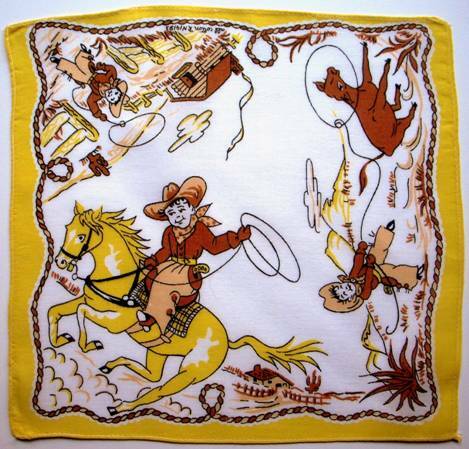 They live on this large bandana which depicts all manner of western paraphernalia. Yum. 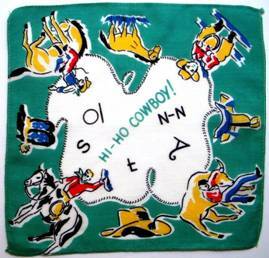 Getting jiggy at the OK corral. 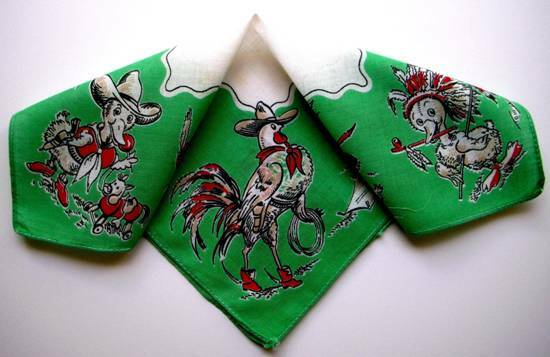 Fun, festive, flirty, fantabulous hankies. 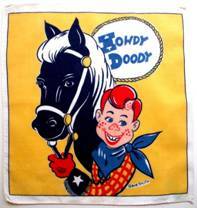 Long before the Muppets, children watched cowboy puppet Howdy Doody with his pal Buffalo Bob. 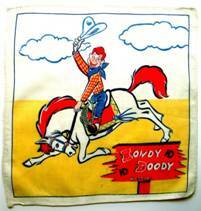 One of the first shows to be filmed at 30 Rock, Howdy Doody ran from 1947-1960. 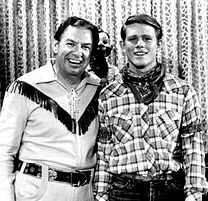 There was even a 1975 episode of Happy Days where Richie Cunningham (Ron Howard) won a Howdy Doody look-alike contest and purportedly appeared on the show. The original puppet now resides at the Detroit Institute of Arts, and his stand-in, named Double Doody (I kid you not) resides at the Smithsonian. 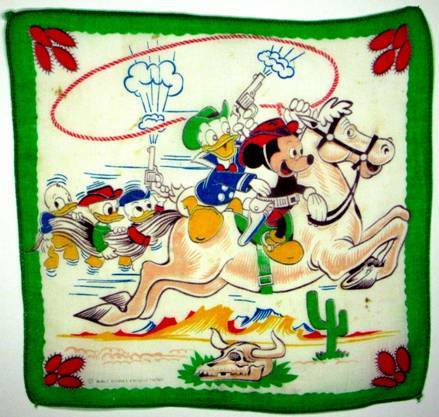 Many Hollywood celebrities embraced the western persona, including Mickey Mouse, seen here with sidekick Donald Duck and nephews Huey, Louie and Dewey, bringin’ up the rear and shootin’ up a storm. 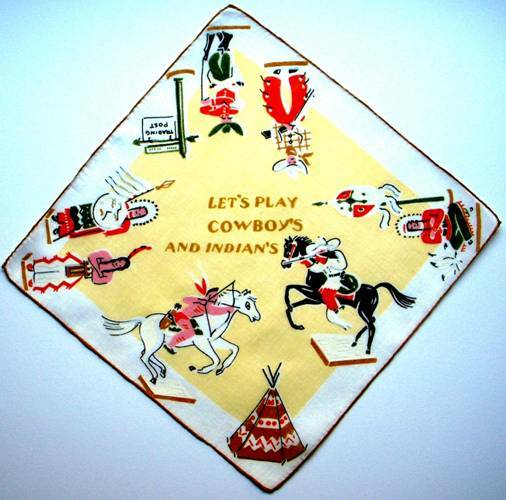 Cowboys and Indians was a favorite game to play in the 1940’s-50’s. 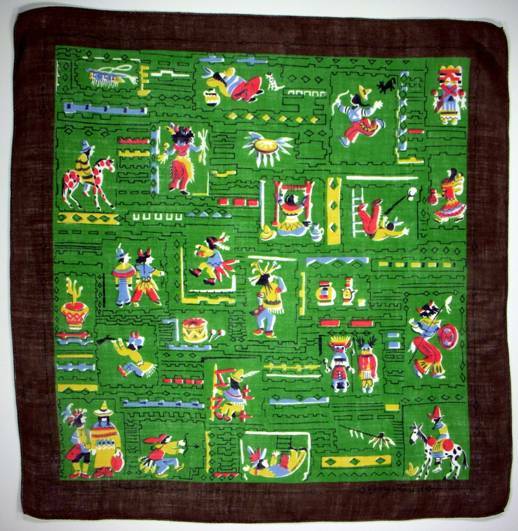 Note each action figure rests on a tiny base, as this hankie depicts actual toy figures. This may be an advertising piece for an actual boxed set. It’s as crisp and colorful as the day it first appeared 60+ years ago. 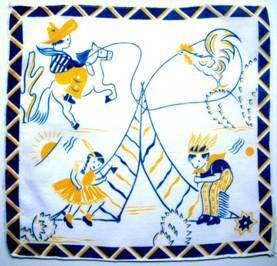 Children dance around the teepee, while a rooster crows at the breaking dawn. He’d better be quick about it. The bold buckaroo is about to lasoo him and end his proud banter. 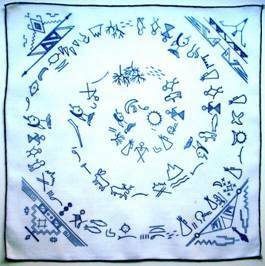 Indian pictographs uncoil like a nautilus from the center to meet intricate graphics anchoring each corner. 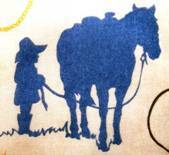 A beautiful piece graphically, and historically interesting for a child to study. The choice of bold crimson to showcase these images is splendid. Here a young brave prances his pony on the plains. LOVE the border of tiny teepees. 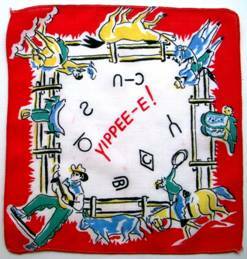 A swirl of settler’s wagons and handsome Indian profiles dance about as each side tries to weigh in on the arriving strangers. The invigorating blue border adds to the overall electricity. My mother was raised in Oklahoma, which fostered a lifelong interest in Native American culture and their traditions, an interest she passed on to us. 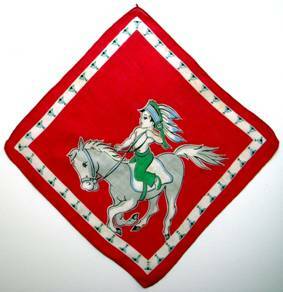 I love this hankie depicting a pueblo of Indians weaving, hunting, playing, resting, riding painted ponies, and dressed in costume for a ritual dance. 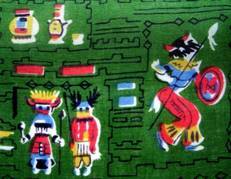 Mom collected Kachinas, which were dolls given to children, and represented things in the natural world or cosmos – the sun, thunder, the eagle, insects, corn, etc. Some mistakenly believe the dolls were worshiped, but they were merely representations of the essence of life which exists in everything God has created. 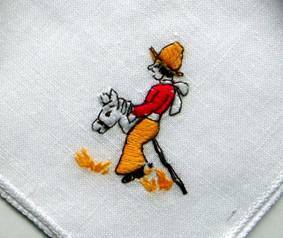 Were my mother alive today, I would gift her this handkerchief. 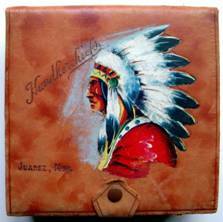 Over the years I discovered several manufacturers used the image of an Indian Chief in their packaging. In today’s vernacular of ‘branding’ this appears to be an effort to link their product to memorable image, which has the added benefit of a play on words, but I’m only guessing. 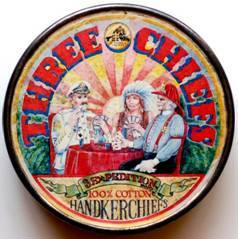 This tin held three handkerchiefs. The image shows a Fire Chief, an Indian Chief and Chief of Naval Operations. 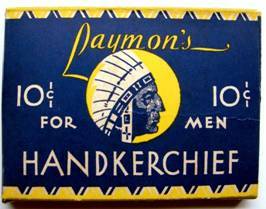 Small cardboard boxes held a single hankie, and the manufacturer adopted the profile of an Indian Chief for his logo. 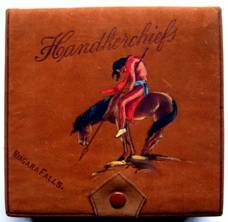 Ladies handkerchief boxes often depicted the image of an Indian Chief. The colors on the suede box to the right are exceptionally rich. 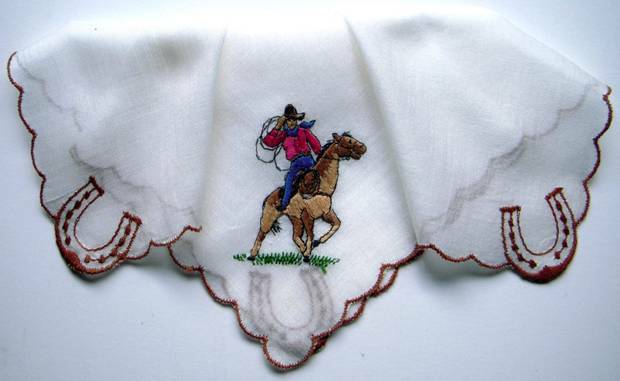 I love all these western images and hope you will too.